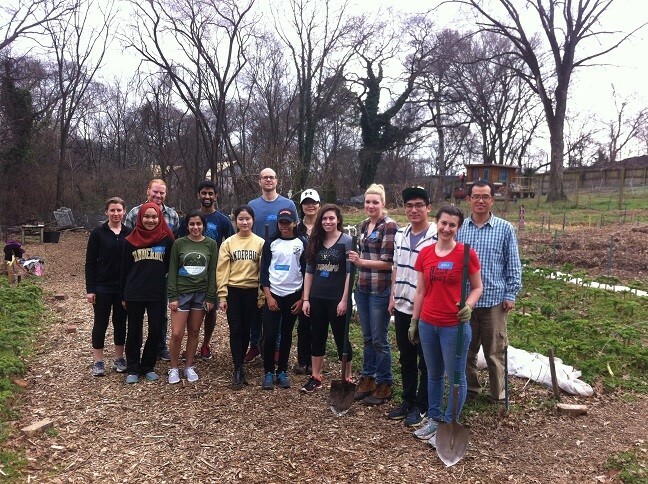 Students will immerse themselves in the conceptualization of community service as it relates to U.S. communities and how or if the same ideas translate across cultures. Redefine exposes students to local community needs by partnering with the Nashville Food Project. Students will serve with a non-profit organization that is delivering real impact in Nashville through its mission of cultivating community and alleviating hunger. A central goal of Redefine is the development of friendships amongst people from different countries. Undergraduate and graduate students from all disciplines are encouraged to apply. Continuing in January 2017, Redefine will consist of four seminars led by experts in service-learning, community development and international student engagement. The seminars provide a foundation for academic exploration of service-learning from the perspectives of the community, the non-profit sector, the student and the university. 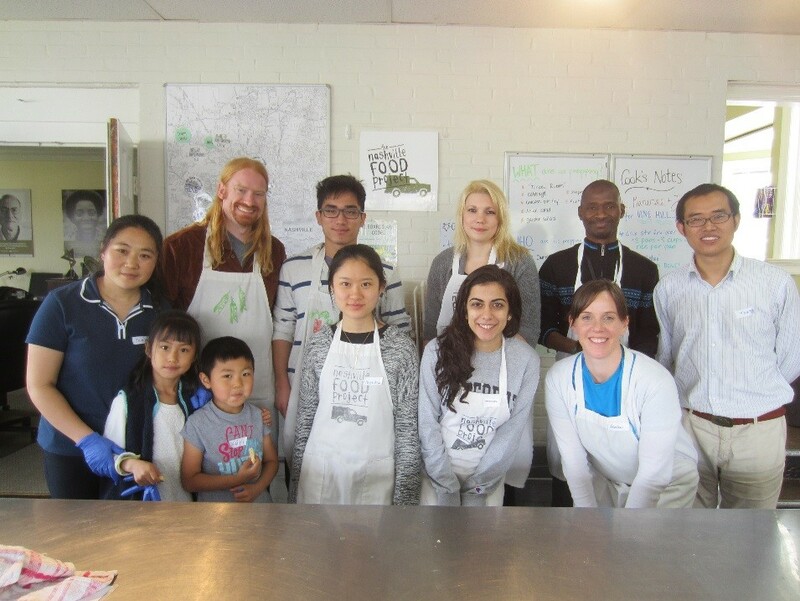 Seminars will be complemented with community service opportunities at the Nashville Food Project. International and American students are encouraged to sign-up, as they will benefit from cross-cultural dialogue and experiences centered on community development and social justice. The following learning outcomes reflect aspects of the program that students are expected to immerse in and learn from. 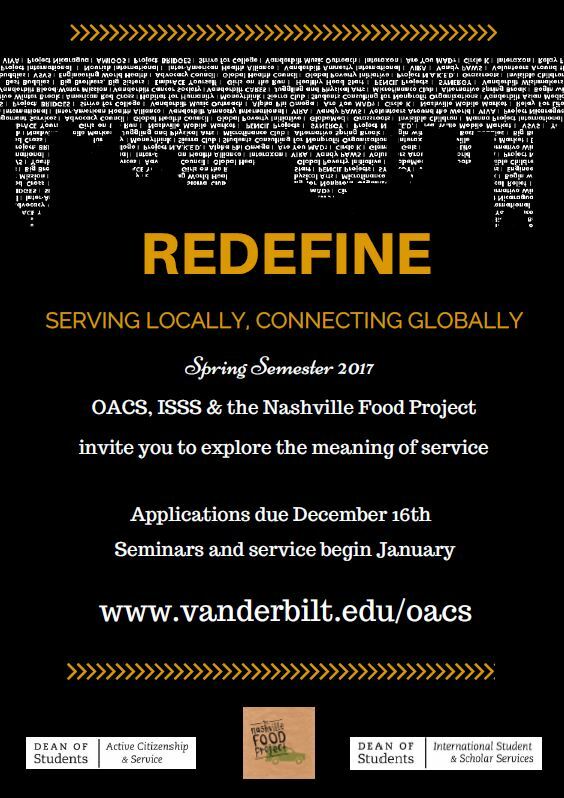 Critical engagement around the meaning of “service” from different cultural perspectives will be highlighted and engagement between the student and the Nashville Food Project will be paramount. Increase critical thinking and reflection about service and develop an understanding of its meanings and impact locally and globally. Foster new friendships with people from diverse countries. Understand and value differing perspectives. The relationship between service and social justice. The systemic issues driving the need for the Nashville Food Project and an awareness of some of the inherent policy implications. Social justice issues which surface at the Nashville Food Project. Applications are due no later than December 16th at midnight. All applicants must have schedule availability on Mondays 6:00 pm – 8:00 pm (for seminars) and Saturday mornings (for service). There will be four seminars interspersed throughout the spring semester, beginning mid-January. Students will also participate in two meal service sessions for community members in East Nashville, and three Saturday service events in conjunction with the Nashville Food Project. There is no cost to participate in Redefine.